A television crew ventures to the remote mansion of a famous artist by the name of Mamiya. Inside they find the place is a dusty wreck, but there is a beautiful fresco of the artist’s wife. 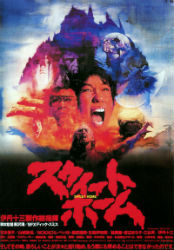 An art restoration specialist, Asuka (Fukumi Kuroda), becomes possessed by a vengeful spirit and digs up a small casket after another crew member, Taguchi (Ichiro Furutachi) kicks over a grave marker. Soon the shadows of the house erupt into life and the crew must rescue their missing members before they are consumed. Their only ally is a weird old man who works at a nearby service station and seems to know quite a bit about the supernatural. Something truly terrible waits for them all deep inside the house. The first half of Sweet Home is a slow burn; there are some impressively ominous woods and the decayed interior of the mansion work well to lay ground work for the tension. At about the 45 minute mark the film explodes into something much more aggressive and strange. Taking a few notes from Poltergeist (1982) and Evil Dead II (1987), Sweet Home throws some great practical effects work on the screen, but is also smart enough to keep everything that is happening grounded with an emotional undercurrent. It occasionally threatens to grow a little saccharine, but never to the point where it intrudes on the horror. Sweet Home measures out its scares almost perfectly, knowing just how and when to escalate the terror.